Neodynetics is developing an advanced energy harvesting system that converts the continuous motion (kinetic energy) of ocean waves to electric power. The films are inexpensive to produce and are designed to maximize the electric power generated as ocean wave motion causes the piezoelectric film materials to undergo mechanical stress and strain forces. The system will continuously generate non-polluting electric power at very low cost from the inexhaustible ocean wave motion. The energy harvesters will have many applications, such as providing ocean buoys and watercraft and of all types with onboard power for sensors, communications and electric propulsion. 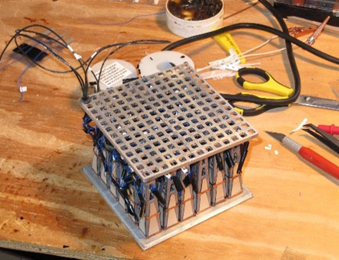 Scaled-up systems can supply utility-class power via large floating networks containing many interconnected power modules. As the technology evolves, miniature power modules will be able to recharge microelectronic devices such as cell phones simply by the motion of walking around. Neodynetics is developing an advanced energy harvesting system that converts the motion (kinetic energy) of wind to electric power. The system uses specially designed nano-materials we fabricated in our lab. The fabrication process produces piezoelectric thin films having a unique multi-layered internal nano-structure configuration. The films are inexpensive and are designed to maximize electric power as the wind causes the piezoelectric elements to vibrate at precise resonant frequencies. The system will continuously generate non-polluting electric current at very low cost from the wind. These piezoelectric wind power generators will be inexpensive and will operate safely and silently having no spinning turbine blades as in traditional wind power system. Being safe, silent, lightweight and modular, these systems will be safely installed on residential and commercial office building rooftops, at the source of electric power demand. As the technology progresses, scaled-up systems will supply utility-class power while small systems will power microelectronic devices such as remote sensors, and communications equipment wherever wind is available.